Vox Don't stand behind minions or allies marked by him, and you can easily burst him down quickly with Aces High. Flicker Be careful of his Passive and ulti stealth. Other than that just run out of his (B) and (A). Skye Stay behind minions. Her Suri Strike can quickly reposition her to the backline in teamfights and the stun is annoying. Churnwalker Your passive movement speed should be enough to dodge most of his hooks. If he does get one of you however, run out of range or use Skedaddle. Samuel Stay out of his Drifting Dark and punish him when he misses his (A), he will keep doing the animation until it ends. Skedaddle his sleep. Ardan Keep your distance and use your Skedaddle for his stun. Catherine You should be able to outrun her fairly easily, and use Skedaddle for her stuns. Her silence won't affect you as much since Gwen is mainly basic-attack reliant. Fortress Kill his wolves first and kite him. Skedaddle out of the way if you need to. Celeste Avoiding her stun should be fairly easy but don't walk into a minefield of her stars. Lance Position yourself to avoid being close to a wall and near his root range. Run away from his rolls as well. Varya Keep track of when she uses her (B). Run out of range of her (A) and don't stop moving when she ults. Ringo Skill matchup. You'll both be equally chunking each other with small bursts but you can catch him out by sitting in a brush and ulting him. Idris His Chakrams early on can chunk your health, so play defensively and walk around where he usually throws his Chakrams. Kestrel Don't try to fight her often, surprise her in brushes. Her arrows will deal a lot of damage to you in any stage of the game unless she's 0/10. SAW Kite him, he'll be slow unless he uses Roadie Run. Do not fight him 1 v 1, he straight up wins. Baron Keep walking around and don't stand in one place if you're low, his nuke can kill you. Joule Keep your distance so she doesn't land on top of you and chunk down your hp. Grumpjaw He can do more than you expect and drop you into the middle of his team. Keep your distance and Skedaddle away. Lorelai Skill matchup. Dodge around her pools and don't walk into her stuns, her piranhas can do a lot of damage if not noticed. Petal Her Munions make it difficult for you to run out without losing health. Kite around her and Skedaddle out of range of her ulti. Adagio Adagio Carry WILL hurt. Skedaddle or run out of his Ulti range so you won't get stunned and damaged. Baptiste Not a fun lane with him throwing stuff at you all the time. Catch him out in brushes and Skedaddle his stuns. Grace Keep kiting around her to avoid her knock up. Also really beefy. Alpha Other than her Prime Directive she doesn't have any massive gap closers, but if she does get onto you you're probably going to die. Run out of range of her ultimate as well. Malene Rush Reflex Block. Skedaddle/ Block either her Light (A) Root or her Dark (B) Slow when she passes through you in that form. Her multiple escape abilities will be an annoyance so call your jungler / support for a gank. Reim Skedaddle his Valkyrie stun and slow him with Buckshot Bonanza. When he starts building tanky you won't be able to do much to him. Krul Constantly check brushes with your Buckshot Bonanza for him. The speed he gets can quickly put him on top of you. Save your Skedaddle for his stun. Tony Stun, huge damage, taunt. and instant peel. Too stronk, avoid him unless you can easily poke/kite him down. Reza Massive Burst, his ulti will make him MUCH stronger than Gwen at almost any stage of the game. Call for a gank. Glaive Glaive is a balanced and interactive hero. Be very careful of his Afterburn and check brushes often. Taka Why does he have an invincibility frame? Just stay with a teammate when roaming around and keep vision where he usually is. Koshka Stun and burst will kill you almost instantly. Try to stay in the middle of your team so the frontline can turn on her if she goes for a kill. Boomstick - This ability is what makes Gwen focus on Tension Bow and crit so much. The extra damage lets you last hit minions more easily, win short trades in lane, and 100 - 0 someone squishy when ahead. A basic harass combo would be to use your Buckshot Bonanza on your laner, then walk up for an empowered attack. Buckshot Bonanza - Your main ability to poke, check brushes, kite enemies, and secure a kill on a low health enemy. When your Scout Cam is on cooldown and you're not sure if you want to facecheck a brush into a 5/0 Glaive, shoot it into the brush. Or just shoot your laner to annoy and poke them. Use this in a teamfight to slow someone like Reim and prevent them from destroying you. Skedaddle - The passive on this ability lets Gwen kite people and be very mobile with the extra 0.8 move speed. Stay along the outskirts of a teamfight to avoid being hit. The main usage of this will be to shake off crowd control (i.e. Ardan's Gauntlet) so Gwen can stay alive. Aces High - Pretty simple ability. Skillshot that stuns and damages someone. DO NOT use this in the middle of a teamfight since you stand still to throw it and can allow people to just dog pile onto you. When chasing someone use your Buckshot Bonanza to slow them, then use Aces High on them. It'll be difficult to land but with enough practice you can do it. A cheese strat would be to sit in a brush and wait for someone to come by. Throw your Aces High onto them, basic attack, Buckshot Bonanza, and basic attack again. You should be able to burst down someone or at least bring them down to low enough hp that they have to recall and lose minion farm. Buckshot Bonanza - This is our main poke tool and the lower CD can allow us to check brushes more frequently without being surprised, but the damage is lackluster and there aren't many benefits to maxing it. Skedaddle - Max this out[/color,] it is already a built in Reflex Block so you can buy Slumbering Husk without worrying about being CC'd. The speed boost is also very important as it can help you run from fights or kite harder if you're hit and lose the passive speed. Having a free Reflex Block on a 10s cooldown is absolutely crucial for a carry. Aces High - Every hero should upgrade their ultimate whenever possible. More damage, lower CD, and higher stun duration is great. Sorrowblade - Buying a Sorrowblade first will give you the raw WP needed to scale into Tension Bow. This is the best option because Gwen also really wants to snowball early on and get away with a lead. Tension Bow- Your second item rush after Sorrowblade to add on massive on-hit damage, as well as a lot of armor pierce. If it gets to the point late game where you can buy 3 crit items, sell Tension Bow. Tyrant's Monocle - More crit along with your Tension Bow to add in even more on-hit damage. Tornado Trigger - Combined with your Tyrant's Monocle to add in 70% crit, the passive movement speed you get from it helps with Gwen's already good kiting ability from her passive Skedaddle speed. Poisoned Shiv - Life steal and Mortal Wounds for someone like Krul or Lyra. The attack speed helps bring up Boomstick more often too. Spellsword - If you find yourself using a lot of energy buy this. The WP you get from it is also nice. Gives some CDR for your Skedaddle to come up earlier. Although there are better options than this. Bonesaw - Unless the enemy team is stacking a lot of armor you will almost never buy this. Use this to shred armor off of your targets and open them up in teamfights. Serpent Mask - If you already do a lot of damage and don't really need anything else, this is a great item to stay alive in big fights with massive lifesteal. Breaking Point - Counter-intuitive to Tension Bow's playstyle of skirmishing quick fights, if the enemy team is a tankier composition then don't buy Tension Bow and buy this instead for consistent DPS. Weapon Infusion - Take this if your build is complete or if you can't buy anything significant before a teamfight is about to happen. Halcyon Chargers - If you want a bigger energy pool and cooldown speed, buy these. Journey Boots - Usually bought on Gwen because it helps with her kiting so much. Metal Jacket - Buy this to have more armor if you want to survive against a WP carry like Ringo. Aegis - Buy this for the Shielding against negative effects and to survive CP carries like Kestrel. Slumbering Husk - Buy this to survive against heavy burst, which Gwen usually has trouble dealing with. Celestial Shroud - If the enemy team is mainly CP this will be a good item choice, but by my personal preference I don't like the inconsistent defense and the fact that it only grants Shield. Trading with your Laner - "Trading" is when both you and your opposing laner initiate a small fight (ie. 1 or 2 basic-attacks / abilities used). Winning a trade is when after you two do the small fight, if you did more damage than the other person then you "win" the trade. Gwen's Boomstick makes it easy for her to win trades thanks to the damage boost from it. Basic Trading Combo - Use your Buckshot Bonanza at a good range, then walk up for a basic-attack with Boomstick. Another combo is to basic-attack first, then use Buckshot Bonanza and basic-attack again if your laner is more mobile, such as Vox. Brush Cheese Kill - Stand in the edge of a brush that you know a Scout Cam isn't in. Wait for someone squishy to come by and use your Aces High on them. Basic-attack, Buckshot Bonanza, and basic-attack again. This will hurt them a LOT and you can chase them down to finish them off. Abusing River Shops - At the start of the game farm up until you have enough for Tension Bow and go over to the nearest River shop to buy it. Make sure you're not seen and stand in a bush. Surprise someone with a lot of damage from your powerspike with Tension Bow and Boomstick up. Buckshot Bonanza them to slow them and finish them off. River Shops are great for getting an unexpected powerspike and picking someone off. 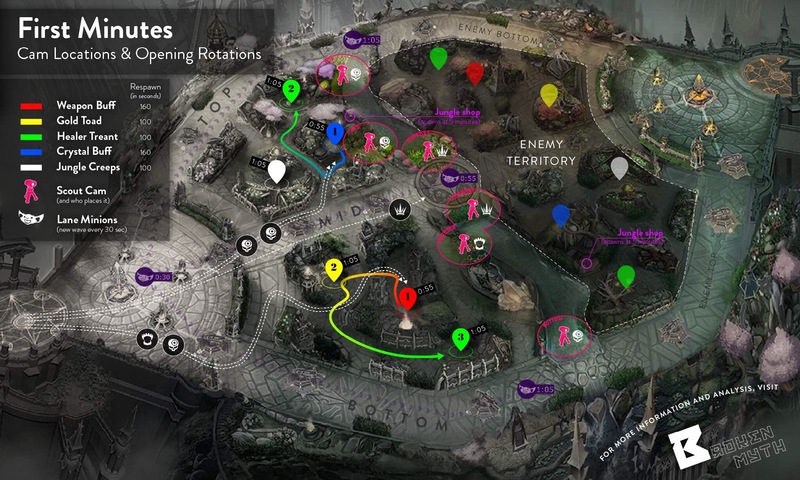 Teamfighting With Gwen - Assuming your frontline is something like Catherine and Rona, let them take most of the damage and CC while Gwen kites around the edge of the fight. Using your Buckshot Bonanza to slow enemies and letting your team catch up to them will also push the fight in your favor. Abusing River Flow - If you're at bot, for example, try to land a Boomstick basic-attack onto your laner and run in the direction of the River to speed yourself up and avoid getting hit by an attack/ability. Kiting / Orb walking - "Orb walking" is the act of "animation-canceling" so you can get the most out of your basic-attacks while keeping your distance. To do this you just simply tap to attack an enemy hero, then immediately tap in the opposite direction to walk there as soon as you fire a projectile at the enemy. Doing this repeatedly will allow you to cover more ground running while hitting them instead of losing 1 or 2 seconds standing still to attack. VGFire is being weird with embedded links. Raw link : https://i.gyazo.com/0d1ffb97e1b08cf56204b9e8ff8644ca.jpg Credit to BrokenMyth.net!